Like lots of us so many of my memories are tied to a food experience. I got to thinking about one today for some reason. The 2010 Texas State Fair started this last weekend. 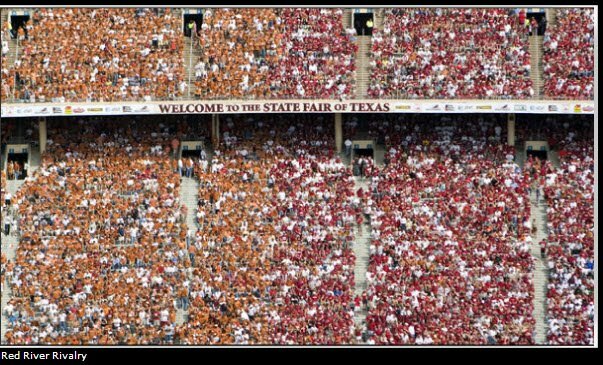 My two fondest memories of the fair are UT beating down OU and crispy golden corn dogs. I've seen the crazy fried foods dreamed up for the annual fair fried food contest. There have been silly creations from fried Coke to this years winner fried Frito Pie (that actually sounds kind of good). 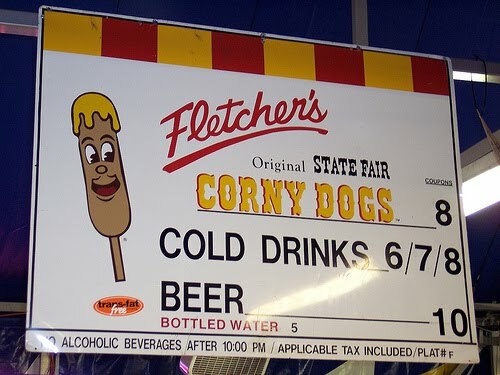 For me though, its the corn dog that I will always associate with the state fair. 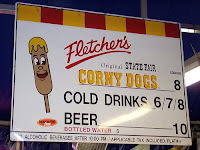 The 1938 Texas state fair saw the introduction of the Fletcher Corn Dog. Corn dogs and I do go way back. Dad, god bless his soul, was passionate about many things. 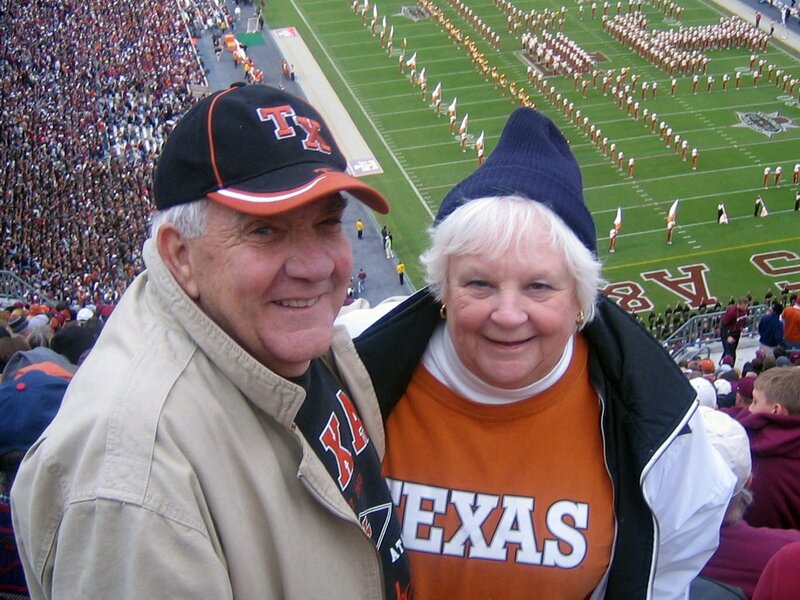 He went to UT and was a huge sports fan, so naturally UT/OU weekend was a big deal. He took me to the game when I was about 10. I'll never forget how good the corn dogs were, how pathetic looking OU fans were, and the yellow streaks of mustard on dad's fingers, shirt sleeve and jeans. Dad could take a simple mustard dispenser and turn it into an amusement ride. Never, not one time in all my years, did I ever see dad hit the corn dog with a stream of mustard on the first pass. When I was looking for some free entertainment I would just give dad a mustard packet and watch the show unfold. It was very likely that the half empty packet of mustard would end up on the back of his pants leg because he sat on it after a blown call by a OU loving zebra! Dad loved to eat good food. Make it himself? It was better that he didn't. Mom, a great southern cook mentored by some old school southern aunts was the cook. Man oh man, she can lay a potato salad down so good that I wish I never got full. I never learned to like left overs. There were none with Dad, Greg, and I destroying everything she served us. So when Mom had to spend a few days in a hospital, and it was up to dad to put some food on the table frozen corn dogs were his ticket. He called them "heat um up dogs". My dad could heat up a frozen corn dog with the best of them. He'd put that cookie sheet burn mark on one side and under cook it on the other. Hit them with a line of yellow mustard and a meal was born. We had heat um ups for three nights in a row. I always wondered just how many days in a row dad could eat an oven toasted corn dog. 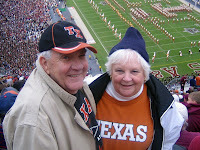 Dad passed the Saturday before UT/OU in 2008. We decided to have his service include family and friends over to the house for the game. Mom picked up a few boxes of Texas State Fair corn dogs. She also made a crock pot full of nacho cheese so we could have the whole state fair and red river rivalry feeling. 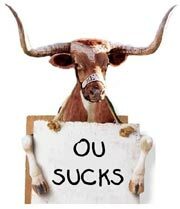 UT won a close and exciting game. We all gave dad credit for the win. Corn dogs, UT football, and dad. Tied together forever.